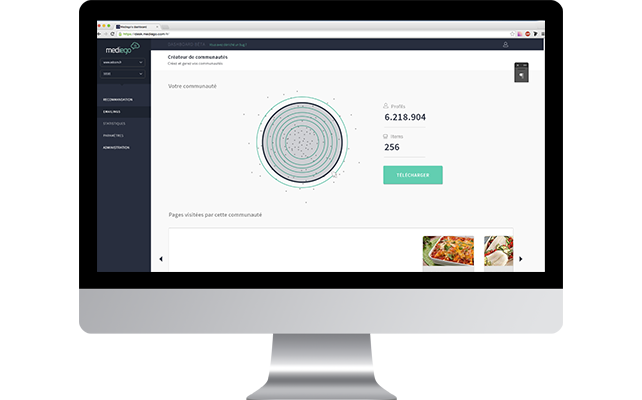 Carry out and optimize your current and future marketing actions in just a few clicks. Optimize the performance and the ROI of all your marketing campaigns by working on the foundation: dynamic categorization and automated targeting. Create categories of audience with high value by targeting them in their purchasing phase. Guide your personalization content by identifying the interests and preferences of your internet-users. 56% of 18-24 year-olds show interest in personalized offers used in shops. Create your categories using your audience profiles. Dowload the file containing the email addresses, generated in real time. The hyper-categorization of targeting guarantees the deliverability of your omni-channel campaigns thanks to the relevance of content for the target user. The power of Mediego’s algorithm is in forseeing the interest and the buying potential of each user, utimately using it for targeting. Your personalized recommendations will target your users in real time, as soon as they’re detected by a predefined category. This is the guarantee of a highly efficient targeting ! We are happy to give you a demonstration! Display content that catches each user’s attention when they visit your website. Increase the click rate with content adapted for each of your subscribers.